I got one of these today, it's a brand spanking new Buck 120 General Boone & Crockett Club edition. The blade is 7½" of paper shredding 420hc which isn't one of the 'super steels' but Buck do a great heat treat and I've never had a problem with any Buck knife made from it and it's used for many of their blades, the overall length is 12", the sheath is Mexican leather with a removable 'Kydex' liner and up to Buck's usual high standard - all I need now is to shoot a moose so I can justify buying the damn thing. Loz may have had the smaller 6" blade Buck 'Special' listed at some time but with so many versions, options and limited runs available over the years, I really don't know Mick. That's a good looking knife, do you use them for utility or just as a collection? 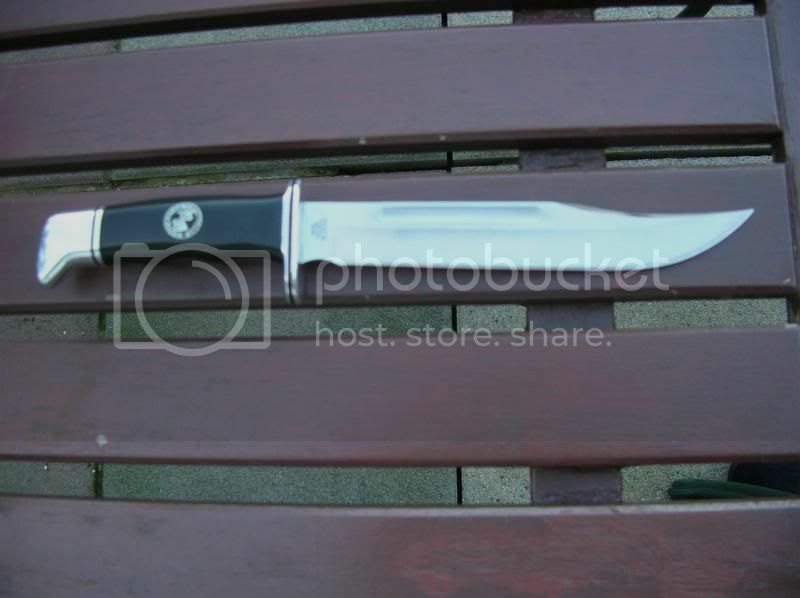 It is a good looking knife & if I'm not mistaken a Buck Hunting knife, this one or a similar design, was used by 'Ghost Face' in the 'Scream' series of movies, I may get one of these types for the Mrs at some point as she is a big fan of the movies. Geordie Ross wrote: That's a good looking knife, do you use them for utility or just as a collection? I'm not a collector Ross, collecting can be very expensive while interests cost nothing and I've always said that I wouldn't buy a knife that I didn't intend to use but I must admit that over the years I've bought some just because I liked the look of them and they'll probably never leave the house - nothing special but I hope that when I die, 'Mrs Moon' doesn't sell my knives for what I told her that I paid for them. 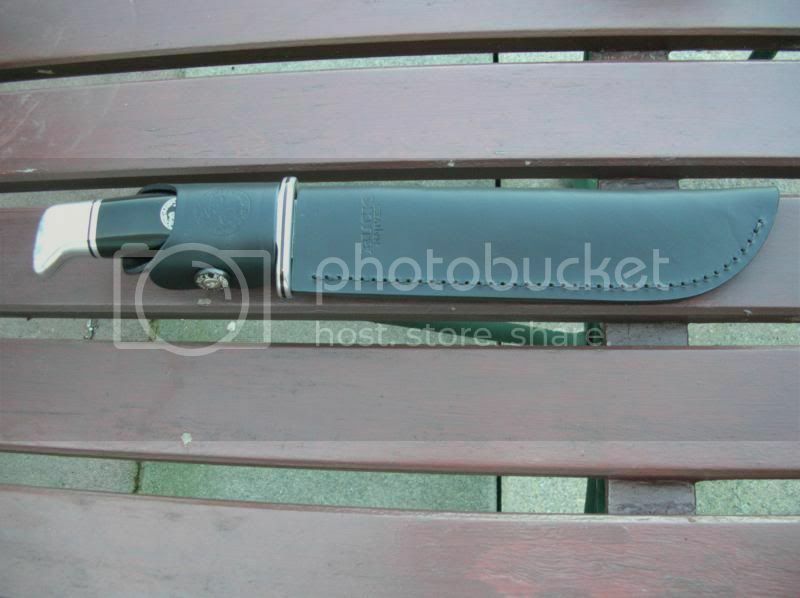 liquidator96 wrote: It is a good looking knife & if I'm not mistaken a Buck Hunting knife, this one or a similar design, was used by 'Ghost Face' in the 'Scream' series of movies, I may get one of these types for the Mrs at some point as she is a big fan of the movies. I believe you're right, the original Buck General 120 was discontinued about 10 years ago but according to what I've read, it's been resurrected every year with various etchings, handle materials and limited runs etc. since then. 'The older I get, the better I was'. I hope that when I die, 'Mrs Moon' doesn't sell my knives for what I told her that I paid for them. I plan on leaving a will of sorts, and giving a copy to anyone who has my email addy. Their true value will be thus realized. When the trouble & strife finds out what my sharps are actually worth, I'll be six feet under and beyond reach. She can have the benefit, and miss me all the more for it. Hell no! I'm not going to bet someone half of my stuff that I'll love them forever!